You will notice I don't do a lot of gift guides here because I'm generally just as confused as to what to give as anyone. I really aim to find the perfect gift - something the recipient desperately would want but would not buy themselves because they have no idea it exists. Yep, pretty impossible and I often end up spinning my wheels. So I've taken a different tact this year by noting some great gifts all year long that I can drawn on come Christmas shopping. 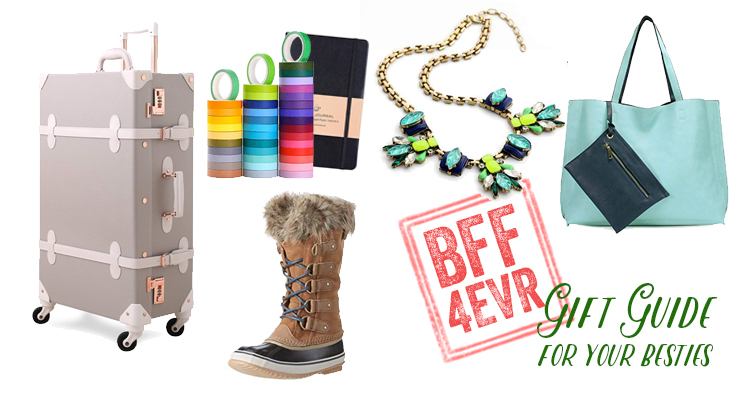 This is my top 5 gifts for your best girlfriends at all different price points. I either have given these as gifts (more than once) or given them to myself so I can be sure they are scores. Retro Rolling Suitcase: Looks like its straight out of the golden age of travel but has the modern convenience of being a spinner suitcase (The best for rolling through airports as far as I'm concerned. Fight me!). This is definitely a generous gift but the kind of thing that is a real treat for your bestie with the wanderlust. Washi Tape + Bullet Journal: For your stationery loving friend, a rainbow of tape and fresh journal is sure to delight them for a grand total of $20. You can't go wrong. The tape is also wonderful for your super organized friends that love to label everything! Sorel Winter Boots: Okay I've wandered back into expensive territory again but I promise you that this is something every women in cold weather climates need to own. I waited years to invest in a decent pair of snow boots and I honestly could kick myself for wasting all those years with frozen wet feet. Do your friend or yourself a favor and get these boots before you freeze your toes off again. Statement Necklace: Need a fun inexpensive gift for your friend that enjoys extra bling or something for the white elephant exchange? This $10 cutie is just the thing. It has a nice heavy weight to it and makes a great addition to even the most plain tshirt and jeans. Reversible Tote Bag: What woman doesn't need a simple but quality bag to cart around stylishly? This tote bag comes in a variety of colors to suit and is a steal at $23. I've given several of these out and often carry one myself. Don't tell anyone but my secret santa is getting one of these too. That's it. Five of my favorite gifts for your girlfriends. I hope I've sparked some gift giving inspiration just in time to get your post holiday shopping gear into mode. If you get any of these or have your own favorite finds to add, please let me know. Thank you for introducing me to this tote! Adding it to my list.